Are you looking for a cute calendar available both for young and adult? This is just for you! It is not only cute but it has great functions as well! 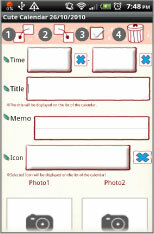 You can create and save plans for a day and also create repeated plans separately. 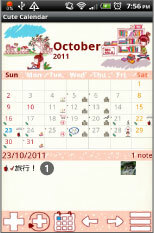 You can switch the images of calendar by tapping images to customize the calendar! You can also add marks on the date to show other plans of your day! 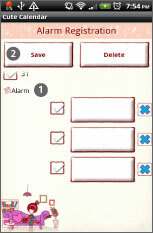 2013.03.24:Fixed a bug of alarm function and now you can change the sort of repeated plans list by press-and-hold! "Repeat Interval"：There are selections "Weekly","Biweekly" and "3". Weekly is to repeat every week. Biweekly is to repeat every 2 weeks. 3 is to repeat every 3 weeks. Added new functions "Search" and "Repeat Interval" on Jun 14! 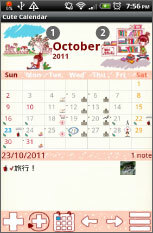 CuteCalendar's mark function is revised on Dec.29! 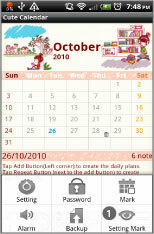 When you select an icon for a daily plan or a repeated plan, the mark is now reflected on the date of the calendar. You can select and save 4 icons each date. Top left→The icon of the top priority repeated plan will be displayed here. Top left icon is only for the repeated plan. 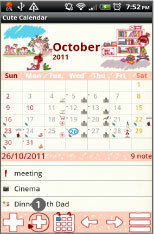 Bottom left→The icon of the top priority of the daily plan will be displayed here. 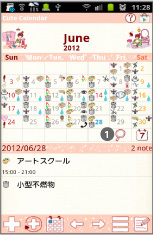 Top right→The icon of the second priority of the daily plan will be displayed here. 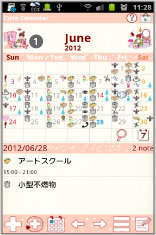 Top bottom→The icon of the third priority of the daily plan will be displayed here. When you don't need to set the icon in a daily or a repeated plan, press Menu button→Mark→select a mark→tap the date to add mark on the date. 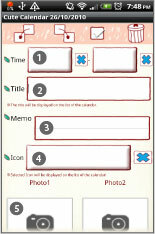 Even you have set the icon in a daily or a repeated plan, you can overwrite marks by usual way. 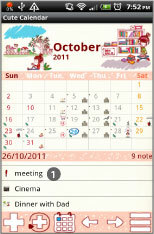 ❶ Calendar Mail:You can send the calendar by email. 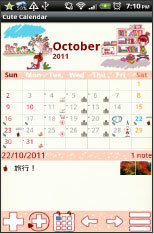 ❷ Mark:Select and stick marks on the calendar. 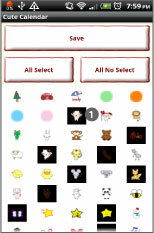 ❸ Setting:Select basic functions of the app. ❹ Alarm:Set vibration, volume and sound. ❼ Setting Mark:Customize the mark list. ❽ Copy to SD card: Copy the data to internal and external SD card. ❾ Recovery: Use this function when you want to return to the previous data. ＊Please note that the current data will be deleted when you use this function. 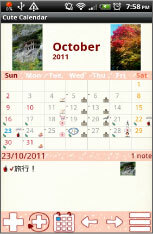 The initial window is calendar. 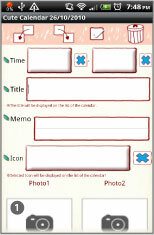 「Add」button : Select the day → press Add button to create a new plan for the selected day. 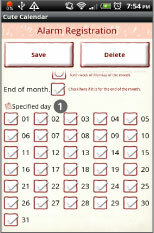 「Repeat」button: Create a repeated plans. 「Today」button: Go back to the today's date. 「Left」＆「Right」button: Move the date right to left. 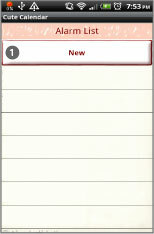 「List」button: You can see saved plans on the list. Press 「Add」 button of the calendar. Move to the Plan Edit Window. 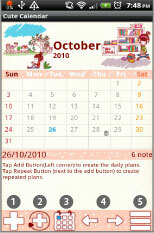 「Move the plan to the previous day」button: You can move saved plan to the previous day. 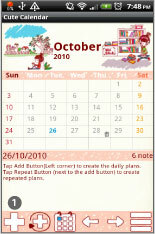 「Move the plan to the next day」button: You can move saved plan to the next day. 「Check」button: Press this checkbox when you have done your plan, then a red checkmark will be displayed on the list of the calendar. 「Time」: Enter start and end time. 「Title」: Enter the title of the plan. This title will be displayed on the list of the calendar. 「Memo」:You can save a memo for the plan. 「Icon」: You can select an icon for each title. 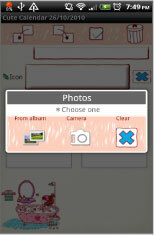 「Photo」: You can save 2 photos a day. This pop-up appears. Select 「from Album」or「Camera」to upload a photo.Delete the saved photo with 「Clear」button. Press 「Back」button when you finish entering all the data. The data will be automatically saved. You can confirm saved plans on the list of the calendar. Press 「Repeat」button of the calendar. 「Date」: Select start and end date. When you do　not enter nothing end date, your plan will be repeated continually. 「Week」: Select the week days of a repeat. All checkboxes should be checked when you select a repeat by date below. 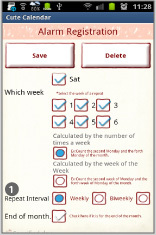 「Which week」: Select the number of week of a repeat. There are two choices here to calculate the repeat. a) Calculate by the number of times a week. Example: Count the second Monday and the forth Wednesday of the month. b) Calculate by the week of a week. Example: Count the second week of Monday and the forth week of Wednesday of the month. 「End of month」: Check here if it is only for the end of the month. 「Specified day」: You can select date to set the repeat. All checkboxes of 「Week」above should be checked when you select a repeat by date. 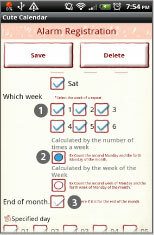 「Alarm」: Set the alarm for your repeated plans. Press 「Save」button above the window to save the plan. Go back to the 「Alarm List」window automatically. You can confirm the saved plans on the list. Press 「Back」button to go back to the calendar. You can confirm the saved plan on the list of the calendar. 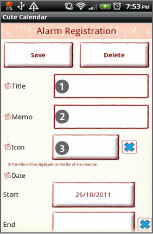 Tap the plan of the list to edit. You can see two images above the calendar. Tap the image you want to switch then「Photo」pop-up window will be displayed. Select 「From album」or 「Camera」to switch the image. Delete the saved image with「Clear」button. This is the image when you switch to the photos. You can select marks that you only need from the list. Move to the Setting Mark Window. When it is opened, all the marks are selected. Tap the marks that you do not need to use. When tap a mark, the background of the mark will turn to 「Black」means, it is not selected. Press 「Save」to save the selection. You can add 2 marks on each date to organize your other plans of the day. Press 「Menu」button → Select 「Mark」. When you select a mark from「Mark」, the mark will be displayed on theright-bottom of the date. After selecting a mark, tap the date to add. When you select a mark from「Mark2」, the mark will be displayed on the right-top of the date. After selecting a mark, tap the date to add. After adding a mark on the date then if you want to delete the mark, select the same mark from the list then tap the mark you want to delete. If you want to delete the mark immediately after adding the mark on the date, tap twice the mark. You can set the alerm for your daily plan. You can send the plan by email. Press “Menu”→take the chekmark of "Height of Title". When you take the checkmark of“Height of Title”of Menu button, The images here become shorter. Tap this button to search marks with a keyword. c) Press”Search” then you can confirm the calendar has returned as before. A new function “Repeat Interval”. You can choose repeat intercal from the list. "Biweekly":to repeat every 2 weeks. "3":to repeat every 3 weeks.